The discovery of a mountain of frozen water lying just under the surface of Mars has been hailed by scientists as game-changer for exploration of the Red Planet. The abundant supply of ice could help sustain a human colony, and may even be an indicator of alien life. "This is a really exciting discovery," said Simon George, a professor of organic chemistry at Macquarie University. "Finding water ice like this is a very important step in opening up habitability of Mars." The massive ice cliffs soar 100 metres high, but scientists with the US Geological Survey believe they could be just the beginning when it comes to what lies beneath the surface of the arid planet. 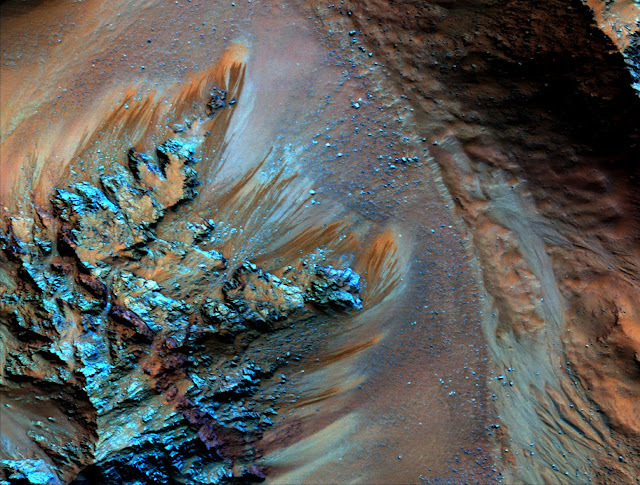 "What this study shows is that there is abundant water trapped just beneath the surface of Mars," said Professor Martin Van Kranendonk, director of the Australian Centre for Astrobiology. "And it also provides an opportunity I'd say in the exploration of Mars to use this water ice as a possible resource for water, for astronauts [and] for experiments. "Maybe even for growing food, it means we don't have to transport water from Earth all that way to Mars, which would basically be impossible. It's just too bulky." Water has been an elusive commodity on the dry and dusty planet. In what seemed like a eureka moment back in 2015, NASA announced it had found water flowing across Mars' surface. "Mars is not the dry, arid planet it was thought of in the past. Today we're going to announce that under certain circumstances, liquid water has been found on Mars," NASA's John Grunsfeld said at the time. The apparent evidence of water turned out to be just a mirage. 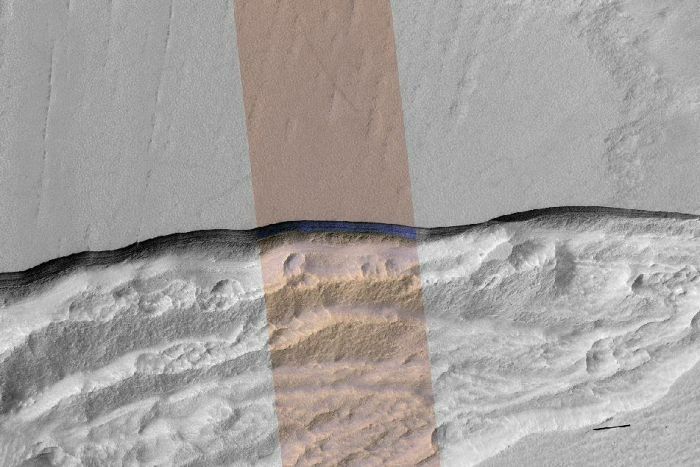 Streaks on images of the surface of Mars, thought to be water, were last year revealed to be just drifts of sand. "We've known about ice on Mars, but we didn't know how close to the surface it was," Professor George said. "These ice cliffs [are] very accessible. And we need water ice on Mars because we can combine it with the CO2 that's very abundant in the atmosphere, and that gives us two very important things for future manned habitability of Mars. "One of those is oxygen, which we need to breathe, and another is methane, which is what we would use to form rocket fuel on the surface of Mars." The ice could also provide a frozen record of the planet's changing climate over millennia. If the ice deposits are capable of supporting human life, there is a good chance it could indicate whether alien life might exist below the surface of Mars as well. "Certainly on Earth we find life associated with big ice sheets. So it doesn't actually have to be liquid water in which life can exist, and it would be very interesting to look at where these ice scarps are melting," Professor George said.